Keeping track of all the earphones KZ launches is almost like a full-time job on its own, reviewing them is even more challenging if possible. 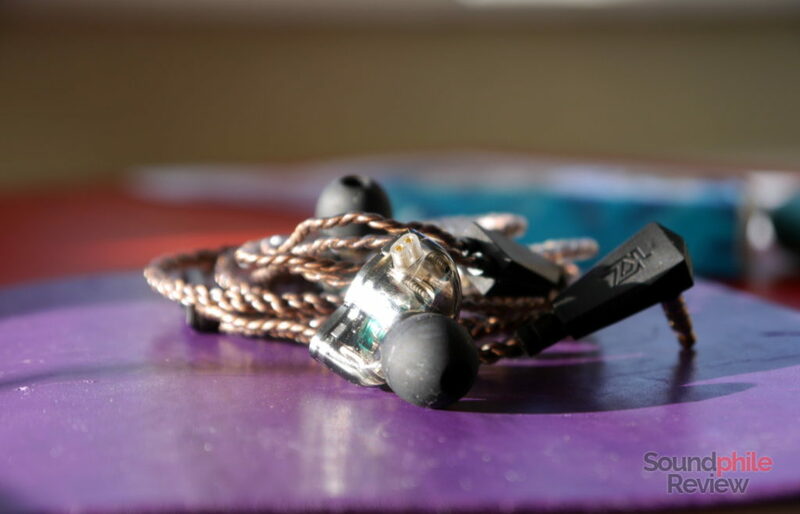 The KZ ZSN is one of those (unusual) KZ earphones that one would not want to miss, though: the company mixed a few new ideas and the end result is a satisfying one. Disclaimer: this free sample comes from Linsoul Audio, who sell the earphones at $18 on AliExpress and at $26 on Amazon. 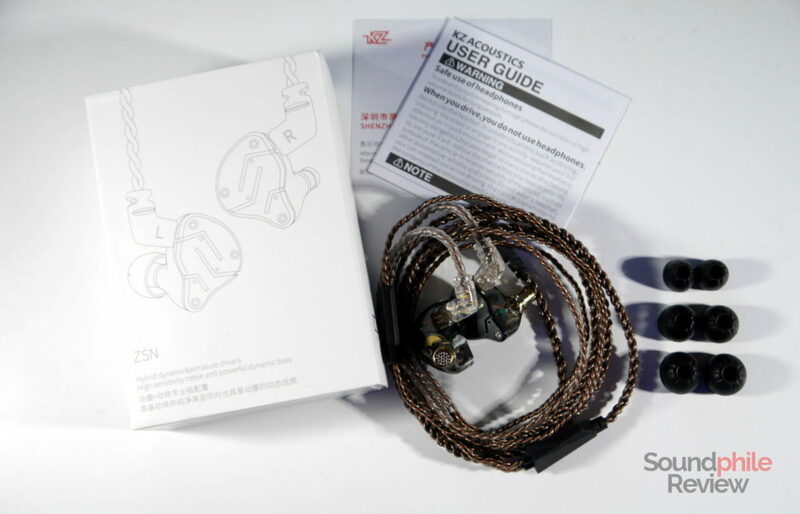 Although KZ did introduce a few new concepts and ideas with the ZSN, it didn’t change the packaging as it did with the KZ BA10 and KZ AS10. So we have the usual cardboard and plastic box, holding the earpieces, the cable and three silicone tips. The KZ ZSN are a bit unusual from a design perspective, at least when it comes to KZ standards: the shell is made of transparent plastic (with a fumé finish in my case, but also available in green/cyan and magenta) and the faceplate is made of metal. It is held in place with three screws, placed in the three angles – as the faceplate has an overall triangular shape. On top of the choice of materials, which is new for KZ, the other news is the shape which reminds me of IEMs such as the BGVP DM6. The shell is in fact similar to that of previous KZ earphones, such as the KZ ZS10 or the KZ AS10, so this is not something that we’ve never seen before. This transparent plastic exposes all the innards, so one can easily see the (relatively) large dynamic driver and the balanced armature. The nozzle is made of metal (aluminium?) which should make it much more durable than usual plastic. This new shape is much more typical of higher-end IEMs – though it’s of course not the shape that indicates the positioning of the headphones (as Campfire Audio, among others, taught us). What’s positive about this design choice is that the KZ ZSN are really comfortable, as their shape is kind of neutral to the ears. There are no sharp edges or other similarly polarising features, so it’s easy to find the right position that is comfortable. The relatively small size also helps with this – my girlfriend, whose ears are much smaller than mine, had no trouble in wearing the ZSN and finding the right fit. As for build quality, the KZ ZSN are not immediately recognisable as cheap headphones, as they’re laudable for their build quality. There are no obvious flaws in how they are assembled and, to the contrary, they are put together quite well with what seem like good materials. If I did not know their price, I would guess they retailed for $50 or even a bit more. Stock cables by KZ have never been great, and that’s true for that of the KZ ZSN, too. It is the same cable used for previous products, with four cores that then divide into two groups of two after the Y-split. Alas it is flimsy and prone to kinks, so it’s really not the best thing. Fortunately, KZ changed the ear hook: it does not have any trace of the annoying metal rods used by previous products, instead relying on pre-moulded plastic to retain its hook shape. Alas the company also changed the connector: instead of having the female connector recessed into the shell, it is now protruding, with the male connector surrounded by a plastic protrusion that covers the female connector when inserted. It’s a strange situation, with the “genders” of the connectors being a bit mixed up. This also prevents one from using aftermarket cables such as the Yinyoo 8-core SPC cable or the Yinyoo brown 8-core silver plated cable. 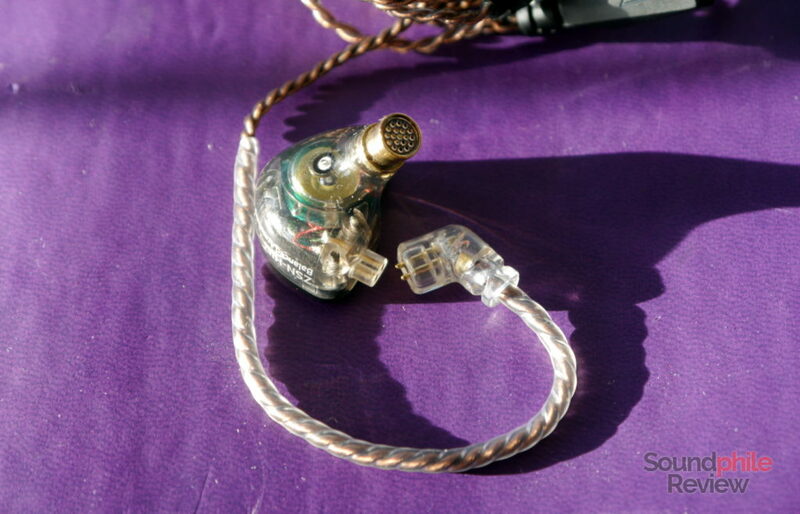 Isolation-wise the KZ ZSN are decent, but alas distant from the 26 dB noise reduction touted by the manufacturer. Ambient noise gets reduced by a little bit, but I could not avoid raising the volume while on public transport. As usual, I used multiple sources when testing the KZ ZSN. Among them, the Audirect Beam and the xDuoo X3-II. Source files used were standard-res FLACs for the largest part. An iFi IEMatch was used in order to remove background hisses caused by the sources. KZ opted for their usual V-shaped approach, but this time they finally got it right by avoiding the usual blatant unbalance that plagues most of their headphones. These are still heavily coloured headphones, but at least they’re enjoyable and don’t display excessive peaks or dips. Their technical ability is a nothing exceptional, but still decent. The ZSN’s Achilles heel is instrument separation, as it is not that good and often leaves you with a flat, mashed-up reproduction of instruments. It’s not too bad, but it certainly feels different from, say, $40 earphones by KZ themselves. Speaking of flatness, soundstage also appears as flat and compressed, with all instruments appearing near each other and almost in the same spot. This leads us to imaging, which is not able to distribute instruments too well. I realise that this description makes it sound like a nightmare, but it is still more than decent enough to be listenable – it’s just clear that these are cheap earphones without much technical ability. Bass is the most prominent feature of the KZ ZSN, being on top of everything else. It is definitely emphasised and far from neutrality: it aims for a large presence and an added thump – and it delivers. It is in fact mostly concentrated in the mid-bass region, with sub-bass being recessed and almost inaudible. The hump is around 90 Hz, and bass starts to be clearly audible around 45 Hz – it is barely there below that threshold. The good news is that it is very decent in terms of quality: bass is largely controlled and, while it lacks finer details and fine distinction between instruments (e.g. in Snarky Puppy’s Tarova, where bass and drums are not that easy to tell apart), it does not leak over mids and has enough speed not to sound bloated or flabby. It punches above what’s common in the sub-$20 price range, even if we extend this consideration to its ability of delivering impact – because it has a bit of physicality, which is always welcome. Midrange is certainly recessed, but not as much so as to sound distant or as to make you wish for more volume. The signature is balanced enough to leave midrange enough room to breathe; instruments (including voices) are placed in the mix so that they are always clearly audible. Tonally-wise, midrange is on the warm side, but gently so: mids stay balanced and the upper range is not too far behind the lower range. This presentation is quite relaxing and enjoyable, especially if you listen to acoustic instruments. It’s decent even if we take a few other matters into account: detail is good enough to deliver the necessary nuances, but you never get to taste the finer ones. Even a few smaller details get lost in the mix, though that’s to be expected. Speed is good, though, so fast transients are rendered with impressive accuracy for the price range the KZ ZSN are in. Treble is more prominent than midrange, but its tuning makes it so that it is not that noticeably in front of mids. Extension is in fact very limited and this leads to a situation where the lower treble is emphasised, mid treble is recessed and upper treble is almost non-existent. This leads to a warm presentation of highs, with little air and almost no sparkle. Truth be told, they sound a bit flat, and I suspect this lack of extension is part of the reason why soundstage and imaging are limited. Using a bit of equalisation to boost the higher frequencies improves the situation a bit, but the balanced armature seems to be limited and it only does so much. I would say that the KZ ZSN are good for most genres; their V-shaped tuning makes them especially apt for modern genres, but it’s up to one’s taste in the end. KZ ZS4: the ZS4 are much more heavily V-shaped, with bass and treble that are much more prominent than mids. Those appear heavily recessed and a bit distant. Bass is almost overbearing, leaking over the mids, while treble is not really detailed despite its large presence. The ZSN are much more balanced, and they have better technical ability, too. Though it is not a radical difference, the ZSN offer slightly wider soundstage, better imaging and better instrument separation. They’re also faster, which leads to percussion instruments being more lively. 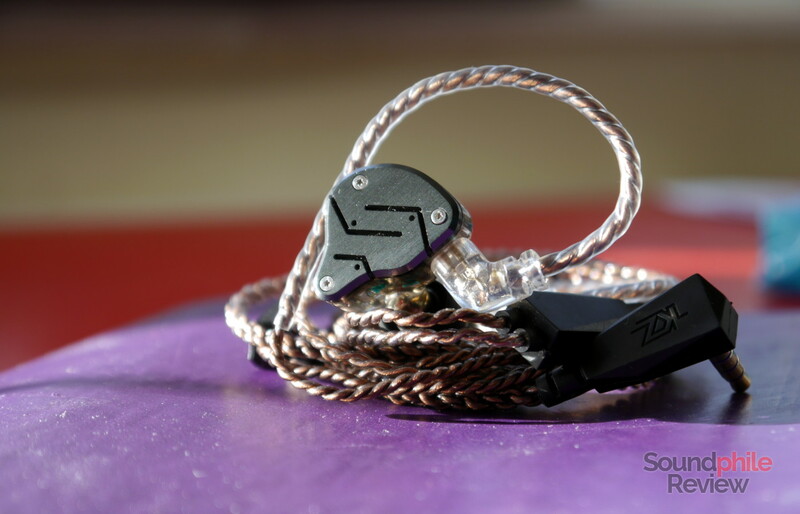 KZ ES4: the ES4 are more balanced and neutral when compared to the ZSN. They offer less bass presence and more treble extension, while keeping the mids front and centre. The ES4 tend to be more detailed throughout the spectrum, and they also have slightly better soundstage width, imaging and instrument separation. They are not as god in terms of speed and control, though, nor are they when it comes to bass extension. KZ ED16: the ED16 are way less V-shaped than the ZSN and, in a sense, they’re their sonic opposite: they place more emphasis on the upper part of the spectrum instead of the lower one. Bass is therefore much less pronounced, while upper midrange and treble are more emphasised. Treble also has better extension, though its spiky nature leads to it being a bit fatiguing. Their soundstage is wider, while imaging and instrument separation are largely comparable. Their tendency to become fatiguing is the main reason why they are rated less than the ZSN, despite them being overall good. I have to say that the KZ ZSN are not especially good at anything. But the thing is that they’re not bad, either. And at less than $25, there’s little more one could ask. All in all they’re more than decent: they’re balanced, with a fun-oriented tuning and just enough technical ability and detail to make them an appealing daily driver with a very affordable price. The KZ ZSN are definitely not the best one could hope for, but they’re good enough to be enjoyable and pleasant. With great comfort and decent isolation, they are good for commuting daily without much worries. KZ really nailed it this time and although there’s still work to make them truly great, this is a step in the right direction – let’s hope they’ll keep on taking them as a starting point and keep on improving it. Great review as always, also do you have any plans on reviewing CCA C10? Hi there, I have no current plans to review them but I might do that in the future if I can get them. 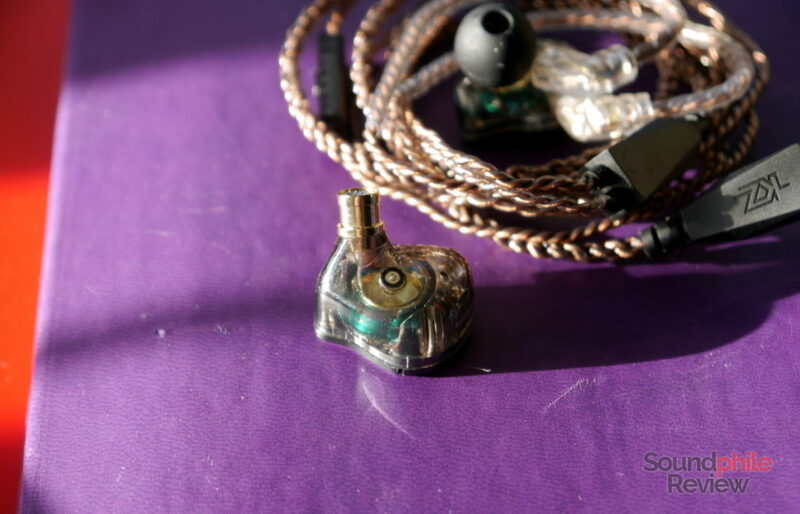 Your impressions of the ZSN does not match with other reviewers wrt other KZ earphones. Please refer to some frequency response curves measuring both the ZSN and ES4 by the same source. The ZSN is clearly more extended. Sub 45Hz does not drop. And subjective opinion is that it has a pretty decent soundstage, not flat by any means. You might have received a faulty unit. I highly recommend reviewers to measure their earphones or at least refer to other people’s measurement works. It should ease lot of guess work. Can you give me a recommendation for which KZ series for the best detailed wider soundstage, better imaging and better instrument separation? 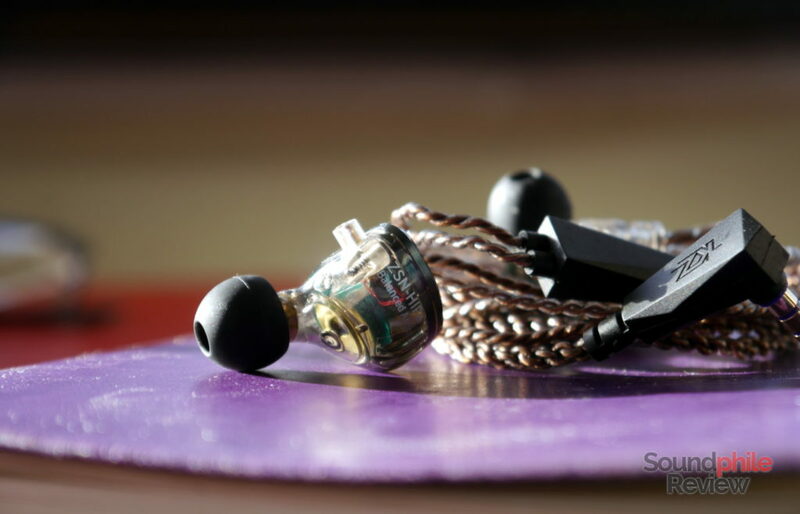 If you have the budget for the AS10, then go for them – they’re easily the best earphones by KZ. Do i need to buy the upgrade cable too? There is some upgrade cable like copper free oxygen, silver plate and copper mix silver, which one is the most suitable and can you tell me the difference? Just buy the one you like the most – cables have no impact on sound.